At Arion Energy, we are committed to developing wind farms in a safe and resourceful manner. Our clients are very important to us and we value their needs. We work attentively with rural landowners, commercial consumers and industrial leaders to make each partnership successful by understanding all aspects of each project and providing a grounded solution for everyone. We blend the benefits of a small, individually focused wind developer with the financial stability of a large development company. Our landowner partners within our projects, receive personal service and are assured that all due diligence is performed. We recognize the importance of developing wind farm technology around the world for a wide variety of reasons, including their economic and environmental benefits. Economically, large scale wind energy provides a supplementary source of income through leasing and royalty arrangements with wind power developers. Small wind turbines can satisfy all your power needs for your residence and operation in a location with sufficient wind resources. Environmentally, wind emission is zero and reduces the dependency on fossil fuels, making wind a promising solution to a green future. The output of a wind turbine depends on the turbine’s size and the wind’s speed through the rotor. Wind speed is a crucial element in projecting turbine performance, and a site’s wind speed is measured through wind resource assessment prior to a wind system’s construction. Utility-scale wind power plants require minimum average wind speeds of 6 m/s (13 mph). Utility-scale wind turbines for land-based wind farms come in various sizes, with rotor diameters ranging from about 50 meters to about 90 meters, and with towers of roughly the same size. Ten 700-kW units would make a 7-MW wind plant, while 10 2.5-MW machines would make a 25-MW facility. A 5-MW turbine can power more than 1, 400 households. The electricity generated by a utility-scale wind turbine is normally collected and fed into utility power lines, where it is mixed with electricity from other power plants and delivered to utility customers. In open, flat terrain, a utility-scale wind plant will require about 60 acres per megawatt of installed capacity. However, only 5% (3 acres) or less of this area is actually occupied by turbines, access roads, and other equipment–95% remains free for other compatible uses such as farming or ranching. 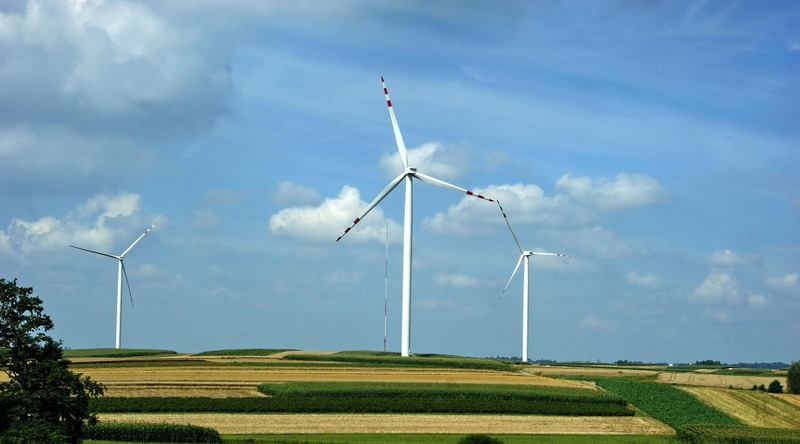 Wind energy provides rural landowners and farmers with a supplementary source of income through leasing and royalty arrangements with wind power developers. Some people who live near proposed wind projects may be apprehensive about them. But when accurate information and knowledge is made available, experience shows that initial concerns are reduced and support for wind farms increases. Noise: A wind turbine 300 meters away is no noisier than the reading room of a library. Flicker: A wind turbine’s moving blades can cast a moving shadow on a nearby residence, depending on the time of the year (which determines how low the sun is in the sky) and time of day. It is possible to calculate very precisely whether a flickering shadow will in fact fall on a given location. Tourism: There is no evidence that wind farms reduce tourism, and considerable evidence to the contrary. For example, in late 2002, a survey of 300 tourists in the Argyll region of Scotland, noted for its scenic beauty, found that 91% said the presence of new wind farms “would make no difference in whether they would return.” Similar surveys of tourists in Vermont and Australia have produced similar results. Many rural areas in the U.S. have noted increases in tourism after wind farms have been installed. Visual Impacts: Visual Impacts can be minimized through careful design of a wind power plant. Using turbines of the same size and type and spacing them uniformly generally results in a wind plant that satisfies most aesthetic concerns. Computer simulation is helpful in evaluating visual impacts before construction begins. Birds & Bats: No matter how extensively wind is developed in the future, bird & bat deaths from wind energy are unlikely to ever reach as high as 1% of those from other human-related sources such as hunters, house cats, buildings, and autos. Questions can also be directed to the National Wind Coordinating Cooperative (NWCC) at 1-888-764-WIND.